This is a wonderfully subversive book, doing what I think furry does best, which is talking about racism. The story-telling is clean and straight forward, suitable for all audiences, and buried in all that are these tales of cultural differences. The ruling class, despite dogs being made of all different breeds, seemed to have banded into trying to bar cats from space. We can see very real world examples that make this theme relevant everyday. Donald Trump screaming to block Muslims entry to the US is in the news these days, for instance. Locally, my wife was part of a grand jury vetting process last week. Twenty white men, seven white women and one black lady. The panel asked everyone what they did for a living, except the black woman. They asked her if she worked. She did. By letting Petra be a cat, Mary E. Lowd can show you all these things dressed up in different ways and slip it by our little filters, our own prejudices. And when Petra meets the otters in person, she wonders, understandably, if otters used to hanging exclusively with otters, understand her Cat expressions. Their ears don't move the same way. Their tails don't express the same way. 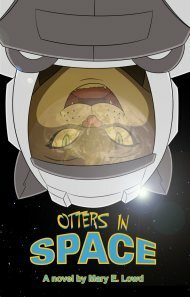 From her point of view, too, the Otters seem to be smiling. All. The. Time. She finds this very off-putting. These biological differences seem to me an allusion to real world cultural differences. For example, over a decade ago there were riots in Los Angeles when African American residents burned down many of the stores owned by Korean shopkeepers. After the fires were out, we learned that the African Americans felt disrespected because the Korean Americans wouldn't look them in the eye while the Koreans felt they were showing respect by averting their eyes. Yes, cultural differences aren't the same as being biologically diverse, but its easy to see the allegorical leap here. And it goes further when Kipper learns prejudice infects her own species. Not just by hating their oppressors, the dogs, but by turning against others breeds of cats. This is the kind of book you could tuck a child of eight into bed with a chapter at a time. Young girls not ready for The Hunger Games can run with Petra to Mexico. Adults who don't like sexual or romantic subplots will enjoy this book. Hard science fiction fans may find this tale a little light, but there's science and rules about space travel tucked in there.